Today, a guest post from Colin Gould, who blogs (occasionally) at ColsRamble. Given my inability to cook an oven roast without burning myself at least once, the last time I picked up a boneless leg of lamb I experimented with cooking it slowly in a frying pan like a giant steak and, to my surprise, got a great result. Foolishly I posted this success on Facebook only to be challenged by Alex to do the same and end up with pork crackling… so here I am; challenge accepted and the result was, again quite surprisingly, really good. As a cheap arse who hates using an electric oven when my solar panels could be cranking that power back into the grid, cooking a roast on my gas hob in an easy to clean frying pan makes a lot of sense and is dead easy (despite the wordy description that follows). You’ll need ~700g pork belly, a heavy base frying pan with fitting lid – large enough to accommodate the pork belly, a couple of seasonal apples (I used Fujis), some fresh sage, salt and pepper. 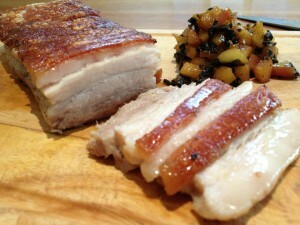 I took the pork belly, scored the skin with a sharp knife and then scorched it with a jug of boiling water. I don’t know if the scorching bit is really necessary, I’ve just always done it when doing normal roast pork. The belly is then patted dry with paper towel and rubbed with olive oil. The skin side is then well salted. To cook the meat, heat the frying pan over a medium heat with a little more olive oil until hot, but not smoking, then place the pork belly in skin side down. It should sizzle. Now you can season the exposed flesh side of the belly in the pan with more salt and some ground black pepper, and pile on a good handful of fresh sage leaves. Once done, place the lid on the pan and turn the heat down to low, then go and find something else to do for an hour or so*. The meat is essentially being part roasted and part steamed in its own juices so avoid removing the lid. You’ll know if the pan is at about the right temperature if a) there is a gorgeous smell of sage and pork filling the house with no hint of burning, and b) the lid is too hot to touch. Remove the cooked meat from the pan and set aside. The pan should have a healthy layer of rendered pork fat and juices in it. Turn the heat up again to a medium/high and throw in some diced apple and the chopped sage leaves from the meat. Cook until the apple softens – there should be enough seasoning in the pan juices but add more if you think it’s needed. A splash of apple cider vinegar might go well at this point. Remove the cooked apple and sage, avoiding as much of the oil as possible, and set aside for serving. Drain any remaining oil/juice in the pan and, like a giant slab of bacon, stick the pork belly back in the hot pan skin side down and let it sizzle. It should only take a few minutes to develop a nice even crackling. If it’s spitting and popping then it’s probably too hot. A better result is achieved with a lower heat over a longer time. Once an even crackling is achieved, flip the belly over with tongs and sear quickly on the other sides so they also get a little colour. That’s it. Slice the pork belly along the scoring lines, or remove the crackling to cut the flesh and break it up separately. Then serve on warm plates with the apple and what ever else floats your boat. The night I cooked this I served it with a quick cannellini bean mash and some (microwave) steamed carrots. If you’re looking for an accompanying drink on a warm spring evening, then we’ve just been trying Oxenberry White Grapple Cider from McLaren Vale, which, although a little sweet for my taste, might just fit the bill. *I think I cooked for about 1 hour and 15 minutes, but only really know that I ignored the 45 minute timer. The good thing about this meat is it’s got a high fat content and using this method keeps moisture in the pan so chances of overcooking and drying out are pretty slim.